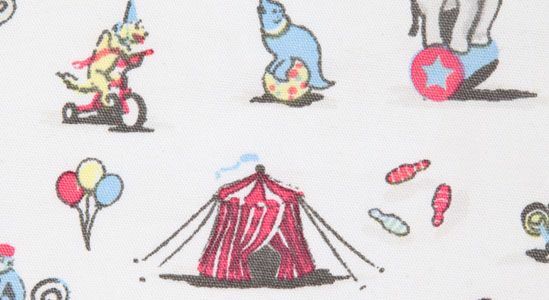 Our Circus design features all the traditional Circus animals; seal on balls, monkeys playing the cymbals, elephants on a stand, dogs on bikes and of course the classic Big Top! The design is perfect for boys or girls as features only the primary colours. Notice: Em & Lu has updated its website in compliance with the EU Cookie Legislation. Please review our policy to find out about which cookies we use and what information we collect on our website. By continuing to use this site, you are agreeing to our policy Read More. What are cookies? For almost any modern website to work properly, it needs to collect certain basic information on its users. To do this, a site will create files known as cookies - which are small text files - on its users' computers. These cookies are designed to allow the website to recognise its users on subsequent visits, or to authorise other designated websites to recognise these users for a particular purpose. What types of cookie are there? Broadly speaking, there are four types of cookie: strictly necessary cookies, performance cookies, functionality cookies and targeting or advertising cookies. Strictly necessary cookies are essential to navigate around a website and use its features. Without them, you wouldn't be able to use basic services like shopping baskets and e-billing. Performance cookies collect anonymous data on how visitors use a website; they can't track users, and are only used to improve how a website works. Advertising and targeting cookies are used to deliver advertisements more relevant to you, but can also limit the number of times you see an advertisement, and be used to chart the effectiveness of an ad campaign by tracking users' clicks. They can also provide security in transactions. They are usually placed by third-party advertising networks with a website operator's permission, but can be placed by the operator themselves. They can remember that you have visited a website, and this information can be shared with other organisations, including other advertisers. Persistent cookies remain on a user's device for a set period of time specified in the cookie. They are activated each time that the user visits the website that created that particular cookie. What’s the law? Recently, the law on cookies has changed. Now sites that try to place performance, functionality, and targeting and advertising cookies need your permission for before they can place them onto your computer. To find out more about the law, click here. How do I turn cookies off? Most browsers accept cookies automatically, but you can alter the settings of your browser to erase cookies or prevent automatic acceptance if you prefer. Generally you have the option to accept all cookies, to be notified when a cookie is issued or reject all cookies. Visit the 'options' or 'preferences' menu on your browser to change settings, and check the following links for more browser-specific information. To switch off third-party advertising cookies, you can turn these off by visiting the Internet Advertising Bureau's consumer advice site here. User agreement By continuing to use our site, you agree to the placement of cookies on your device. If you turn off cookies for your browser, this may hamper your experience on Em & Lu.